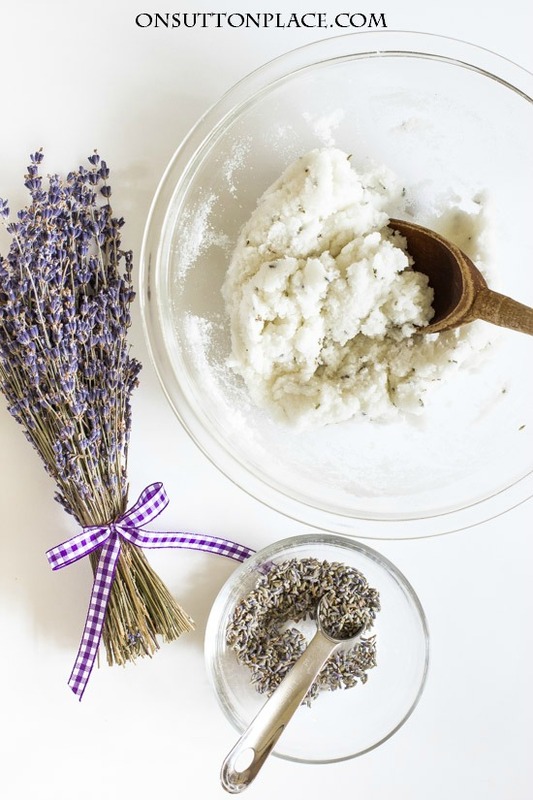 This DIY Lavender Sugar Scrub Recipe is the perfect, 4 ingredient answer to dry hands and feet. Use any time to restore moisture and clear away dead skin. Easy and fast! I remember the first time I smelled the scent of lavender. I was maybe 15 and had walked into a Crabtree & Evelyn store without knowing what it was. I still remember thinking that I wished I had a bunch of money so I could buy one of everything! As soon as I sprayed on Lavender Eau de Toilette, I was smitten. It is still, to this day, my favorite scent. That’s why one of the very first things I made when I opened my online shop was lavender sachets. I have not had much luck growing it myself, but I will never give up trying. Just the very thought of having my own lavender is all the incentive I need. 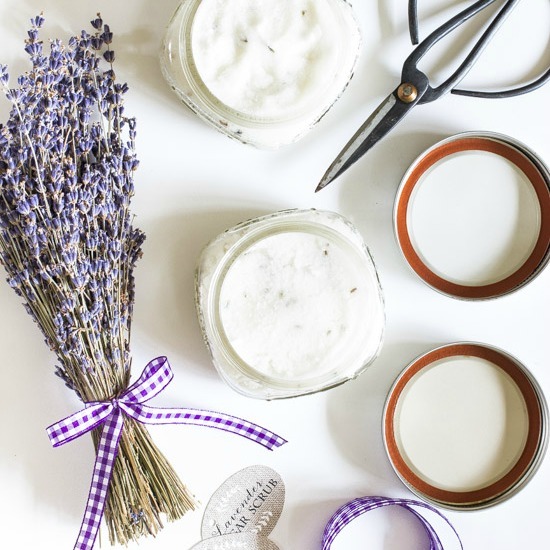 So…in the spirit of sharing my lavender obsession, up today is a DIY lavender sugar scrub. If you’ve never made a sugar scrub, you are in for a treat. They are the best thing ever to restore moisture to dry hands or feet. I always use sugar scrub on my hands after gardening. It really does work miracles on abused hands. The ratio for any sugar scrub is 1 cup sugar to 1/4 cup oil. I prefer coconut oil but any kind of oil can be used. Canola and olive oil are good choices but keep in mind the olive oil adds a light green tint to the scrub. To soften the coconut oil, microwave the jar for a few seconds before measuring. Soften coconut oil in the microwave for a few seconds before measuring. Combine sugar and coconut oil in a large bowl. Stir until completely mixed together. Add lavender buds and lavender essential oil. Stir again. Package in air-tight containers. Glass mason jars or metal jars with a screw top lid work best. Once you have your scrub mixed together, package it in air-tight containers. I use wide mouth 8 oz. Ball jars but any sort of jar would work as long as the mouth is big enough to scoop out the scrub. This two cup recipe makes two 8 oz. jars of scrub. If you would like to give a jar or two as a gift, I’ve included some custom tags in printable form. Just print, cut out and punch a hole. Attach the tag with a piece of ribbon or twine. I used Young Living Essential Oil for this post because I had it on hand. My honest opinion is that a less expensive oil would work just as well. As I have become more comfortable with essential oils and their uses, I’ve tried brands other than Young Living. I am very happy with Rocky Mountain Oils and can purchase them through my Prime membership on Amazon. They are significantly less expensive and arrive so much faster. I will provide a list of sources at the end and include three different price points for lavender essential oil…that way you can decide which one is best for you. Thank you for stopping by and for your friendship. See you soon! Thanks, Ann! I used to have a HUGE lavender bush and still have lots of organic buds left. Sadly we had to dig up the bush for two reasons: the meter reader dude was threatening us b/c it kept getting bigger and more difficult for him to get behind it to read the dumb meter…….but the REAL reason was I found out the hard way there is such a thing as underground bee hives. I was watering the bush and must’ve stepped on it or something cuz the next thing I knew I was completely attacked by a billion stinging bees. It was BAD – I ended up getting an infection from some of the bites on my shins and to this day carry scars! I had to go get a tetnus shot too! So that is my unhappy story of the tiny little cheap plant that grew so fast in its sunny dry spot and grew to be humongous and gave me much much pleasure. Sniff. Oh and you mentioned your first time smelling lavender – first time I ever did I had the same reaction – what IS that scent?????????? I happened to be in Provence just before lavender harvest time – and was driving through fields of it. I freaked. Every time I smell it I think of that experience! So thank you for your recipe, and for the tags and for inspiring me. I think I will make some tomorrow since the weather is so awful. 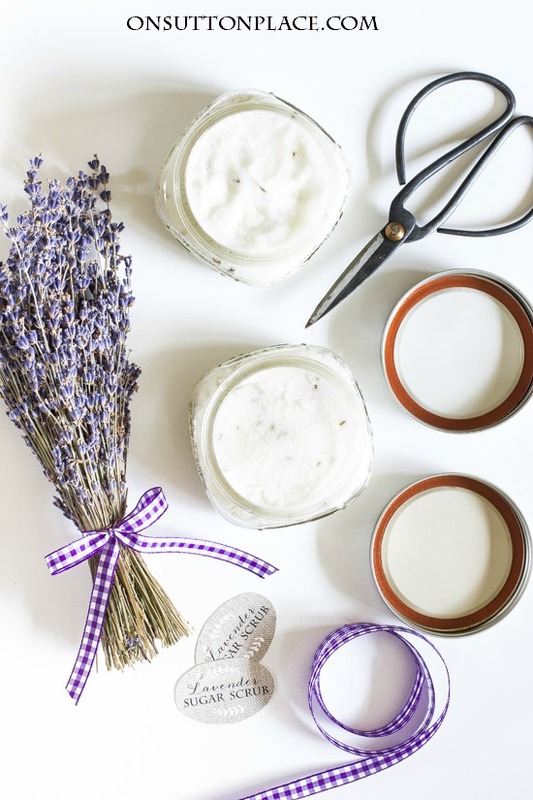 You also may be able to buy lavender buds at World Market. Thanks for the recipe. Made a jar for my wife to place in her Christmas Stocking. It smells amazing. I hope she likes it. I think she would love anything that you made by hand. Merry Christmas! Thank you for this recipe! I made 8 jars to give as gifts this Christmas season and I used your affiliate links to purchase some items! Great ideas especially at this time of the year!!!! 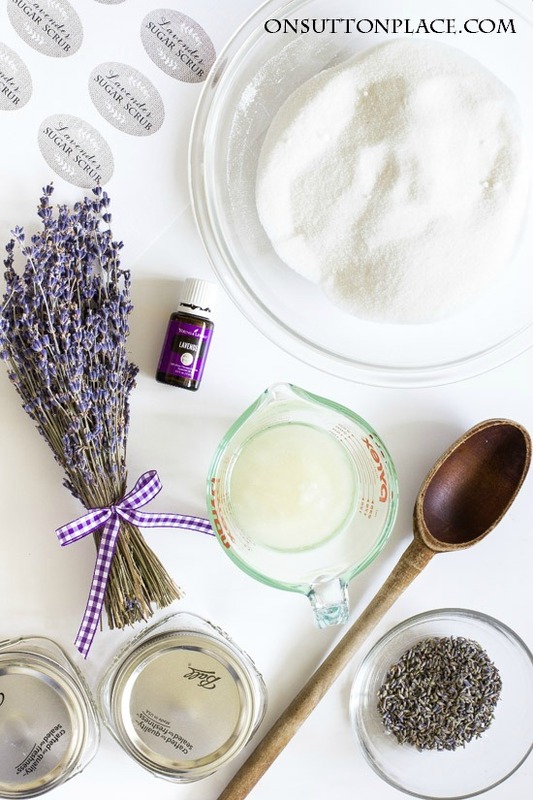 Sounds interesting but could I make this without the lavender buds? Sure! You can also use any type of essential oil you want or have on hand. Enjoy! I made this and it is really nice! Thanks so very much! I purchased 8 small PLASTIC “Mason” type jars (small) at Michael’s for $5.00 to put the scrub in. I didn’t want people to have to take glass into the shower/bath. This is cool. How long can you store these before using? HI Nadia! They can be stored for a month or two if the jars are not opened. Once you open and start using, it does dry out a bit. Enjoy! U have the greatest site ever.Im new to using the internet,and when I found ur site I could care less about looking for anything else.Thank u so much. another batch for the staff. I adore your lavender recipes Ms. Ann!! Thank you for sharing with us!!! Is the lavender buds necessary for the scrub? Hi Penny…no they aren’t necessary. They just add a wonderful aroma. Hope this helps! Hi Anne have you experimented with different sugars? I’m wondering about raw instead of plain white sugar. No I’ve never tried raw sugar…but if the granules aren’t too big I think it would work fine! I’m so excited that you posted this!!! All I need to get are the lavender buds:D The way you packaged this was darling as ever too! Thanks, Ann! Thanks for this great idea, Ann! I just made this as a birthday gift for a friend who loves lavender. I wanted to provide some feedback based on my experience. The recipe was spot-on and made a nicely textured scrub, and it made my hands so smooth! While I love the smell of coconut in baked goods, I felt that the coconut oil aroma masked/conflicted with the lavender smell, so I ended up using a lot more lavender oil on that batch. I used olive oil on the second batch, which had a milder aroma, but as you mentioned, it made the scrub yellow (plus it reminded me of all the salad dressing I make with olive oil!) I used canola oil on the last batch, which was the most neutral and didn’t compete with the lavender. Of all three, I liked the aroma of the canola oil batch the best, but I found the coconut oil to feel the most luxurious on my skin. I hope this feedback is useful to your readers. Is the coconut oil a “solid” that needs to be heated to liquid or is it a liquid form to start i.e. olive oil or canola oil? The coconut oil is a soft solid. You can microwave the jar of coconut for a few seconds to soften it before measuring. Just made this last night as birthday gifts for 2 of my girlfriends. They’re going to love it! And my kitchen smelled so good!!! 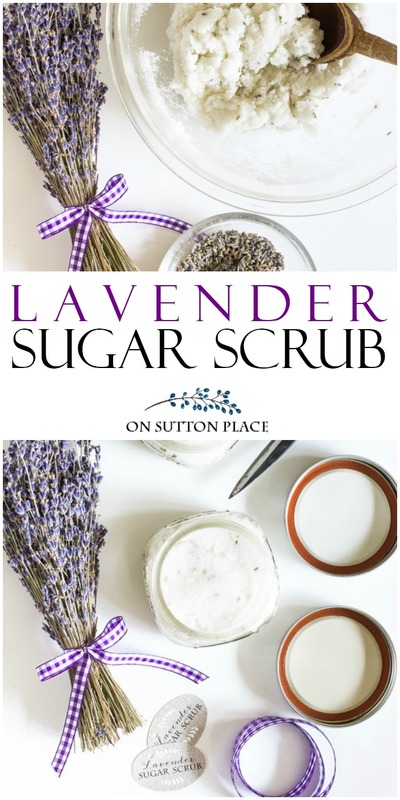 Thank you for sharing Ann”s Sutton Place lavender sugar scrub recipe. I definitely am going to make this for little gifts for friends. I live about an hour away from any craft store (other than Walmart) and shop on Amazon Prime, also. I bought some essential oils from Piping Rock but might try Rocky Mt. due to your recommendation and the reviews. Are you familiar with Piping Rock? Your advice, good ideas and pretty pictures are a pleasure to me and brighten my day. I think I should dry some lavender and think ahead for gifts to have on “hand” for pampering the recipient. My friend and I were talking about simple hostess gifts that don’t seem to be given like they used to. Now this would be a useful yet special gift to give !! Love it. I’m pinning it. What a great gift idea! This is something I will do with the grand kids as a craft that the can give their moms for mother’s day. Thanks, Ann. 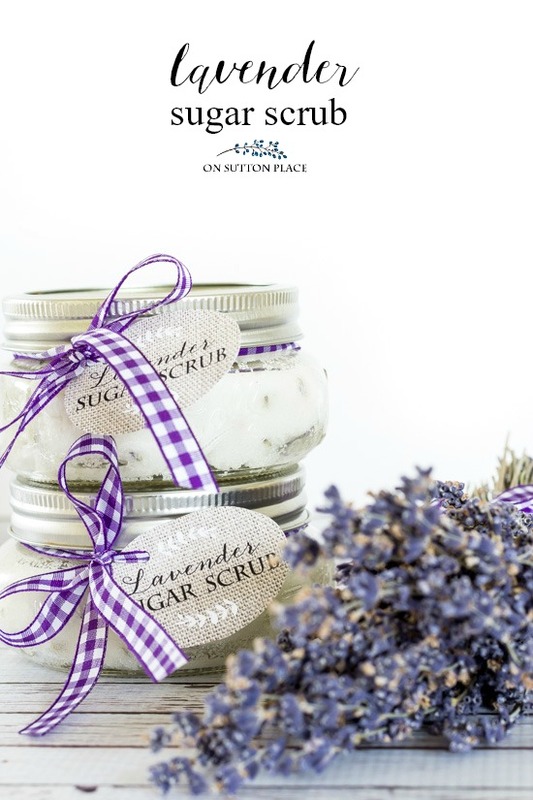 I live in an even smaller town – no Hobby Lobby or Lowe’s here :) I love lavender and can’t wait to try making the sugar scrub. Your photos are gorgeous! I am having a problem printing the tags. Is there some place I need to “HIT” to get them to print? Hi Karen! Thank you so much for asking this question. I forgot to put the download link for the tags in the post. I just added it so you should be able to download and print now. I am so sorry! I love your website, Ann. Where do I purchase lavender buds? I love this idea and can’t wait to try it. And thank you for the info on essential oils- I’ve been interested in using them and I’m happy to know that you think highly of a brand found on my trusty Amazon! You are welcome Jeanne! I seriously don’t know what I would do without my Amazon Prime. The time it saves me, not to mention the money, is amazing. As always, I look forward to receiving your email. You are such an inspiration to me, even if I don’t make you ideas. It makes me.happy just to see what you think up next. I just happen to have all these items on hand! I may have to try this. What a great Mother’s day gift this would make too Ann. Thank you for sharing. Hi Nanci! I just put my jar of coconut oil in the microwave for a few seconds to loosen it up a bit. Maybe 10 to 15 seconds. It will sort of pour right into your measuring cup.